Fig. 001. 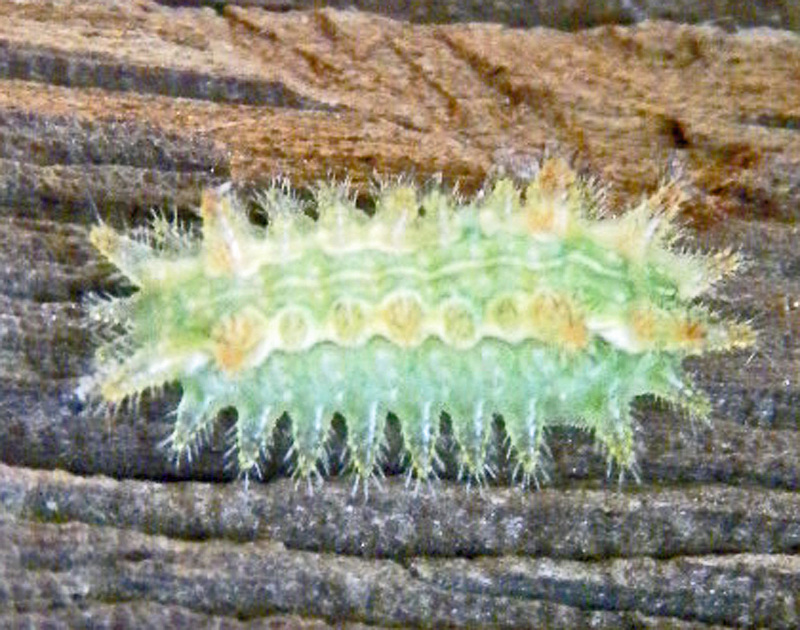 Spiny Oak Slug, photographed by Megan Bonnett at McKinney Roughs Nature Park, This specimen is primarily white in color, while the typical specimen is green with narrow longitudinal reddish stripes. The spiny oak slug (Euclea delphinii) is the larva (caterpillar) of a limacodid moth. The North American variant of this moth is mostly dark brown, with a conspicuous triangular green patch on the median portion of the upper wing. The larva typically has a bright green — in today’s parlance, many would likely call it “neon green” — body with two longitudinal pale green, orange, or red stripes, but a wide variation in coloration is observed, as in Megan Bonnett’s white specimen depicted in fig. 001. 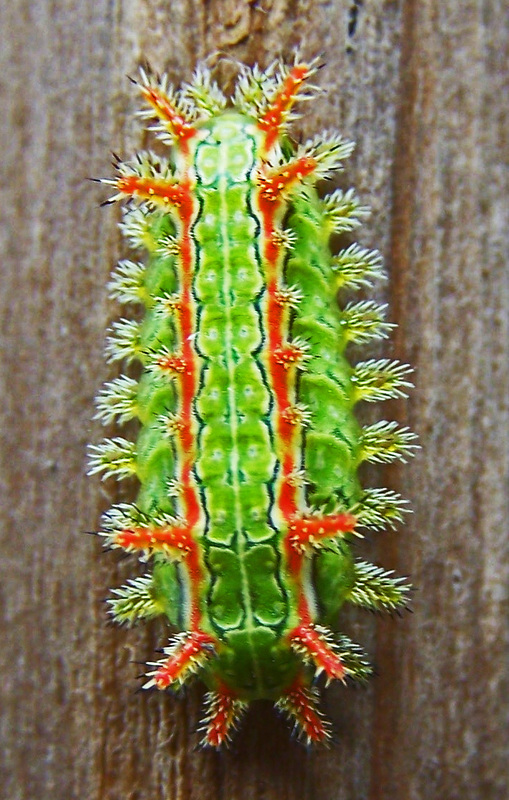 The caterpillar’s body is adorned with a series of spiny tubercles, positioned along the dorsal body where the contrasting stripes are found when such stripes are (usually) present. Additional spiny tubercles adorn the peripheral body. The spines on the tubercles easily penetrate human skin when one comes into contact with the larval body; a toxin released by the spines produces a mild sting that is generally not medically significant, though allergic individuals are apt to experience more complicated effects. The etymology of the generic epithet, Euclea, is discussed in some detail in the taxonomical exposition at the tail of this article, as well as on another page. Click on the link to view that material. Fig. 100. Spiny oak slug (Limacodidae: Euclea delphinii), photographed by Megan Bonnett at McKinney Roughs Nature Park. This specimen has the typical coloration for the species, though a wide variation in coloration among brood young is common. Hello, Jerry! I wanted to share a couple of photos that I took during my time working at McKinney Roughs Nature Park as a naturalist. It was one of my hobbies to take pictures of anything I couldn’t identify and try to figure it out. I learned about the spiny oak slugs from you and wanted to share these images. Have you ever seen a white one like the one in the first photograph (fig. 001)? I took these photos sometime around October/November 2014, down near the river on a trail. I think the white one may have been on a cedar elm or a hackberry. Do you know what their host plants might be? I asked Megan to share more about her background, and she explained she graduated with a bachelor’s degree in wildlife biology from Texas State University. McKinney Roughs Nature Park is comprised of 1,100 acres covered in Post Oak Savannah, Blackland Prairie, and East Texas Piney Woods. Through the middle of all this flows the Colorado River, providing a riverine zone that teems with wildlife of all kinds. The Park is operated by the Lower Colorado River Authority (LCRA), and is located at 1884 Hwy. 71 West in Cedar Creek, Texas. Megan’s photos are unusually good, and — in particular the white specimen she photographed — add much to this present article. I thank Megan for sending them to me. It is interesting to note that the photos taken by Janet FB, depicted below, were also taken in Cedar Creek, which suggests these moths are unusually common in the Cedar Creek area, possibly because of the prevalence there of botanicals these caterpillars thrive upon. Her question about the dietary habits of this slug led me to recover some of the research I’d done earlier on this caterpillar. They are often found munching on the leaves of rosid eudicot angiosperms, and — as the common name implies — are fond of trees in the rosid order Fagales (embracing the oaks, beeches, chestnuts, hickories, and birches), with a particular affinity for trees in the genus Quercus (the oaks, comprised of some 600 species). However, they’ve also been found on a variety of plants in other rosid orders, including apple, hackberry (note Megan’s white specimen may have been on a hackberry leaf), and cherry, all of which are in the order Rosales, which also includes the elms, suggesting it is not unlikely her specimen was on a cedar elm. They have also been found on ash (Rosid: Lamiales), basswood (Rosid: Malvales), maple (Rosid: Sapindales), poplar and willow (Rosid: Malpighiales), and sycamore (Rosid: Proteales); as well as on blueberry shrubs (Asterid: Ericales). The rosids comprise a large clade of flowering plants, and contain some 70,000 species. Thus the rosids embrace more than a quarter of the angiosperms. The rosid clade is divided into 16-20 orders and some 140 families. The rosids and asterids (note that spiny oak slugs are often found on blueberry shrubs, members of the asterid clade, in the order Ericales) one are the largest clades in the eudicots. A clade is, by definition, monophyletic; i.e., it springs from a single ancestor and contains all that ancestor’s descendants. As with many other caterpillars we’ve examined on BugsInTheNews, the spiny oak slug is not as picky about its dietary choices as its common name indicates. On the other hand, inasmuch as we do see evidence of regional concentrations of this species, the ability of the caterpillar to thrive and mature to adulthood on so great a diversity of botanical food sources may be limited. In other words, though we may find this caterpillar on a wide variety of botanicals, those on which it is able to complete its life cycle in abundance may be somewhat restricted. Can you help me with this beautiful critter? 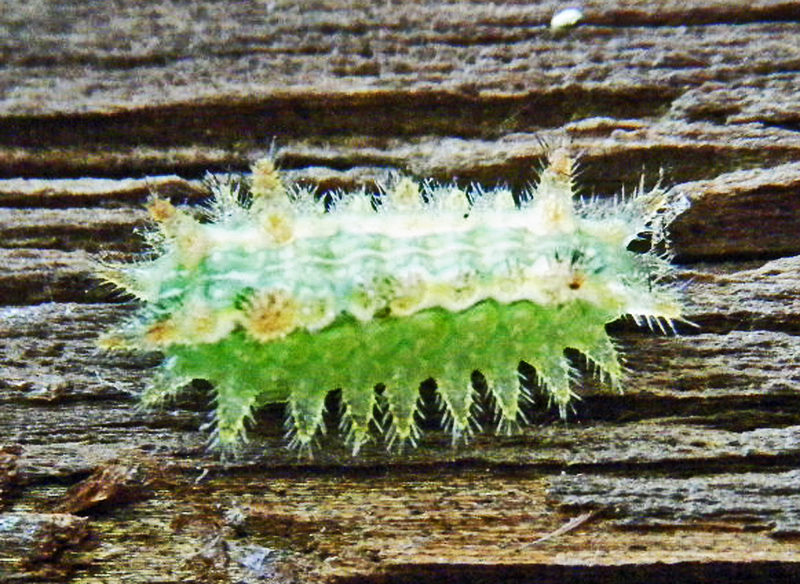 It’s a gorgeous caterpillar about 1” long – found alive. I thanked Janet for her excellent photos. They add significant details that are lacking in earlier images sent in by Mark Turvey. The photos from that encounter, taken on 30 October 2010, are posted and described below. This specimen has bright orange longitudinal stripes, compared to the pale green stripes of Turvey’s specimen. Color differences within species is common, throughout the animal kingdom. No doubt we will, in the future, receive photos of even more starkly different specimens from other viewers. I found this interesting looking caterpillar on the support poles of one of my barns, and thought you might like to see it. The order Lepidoptera (which includes all the moths and butterflies) contains some of the most beautiful organisms on planet Earth. Among these are a number of the most beautiful caterpillars imaginable. 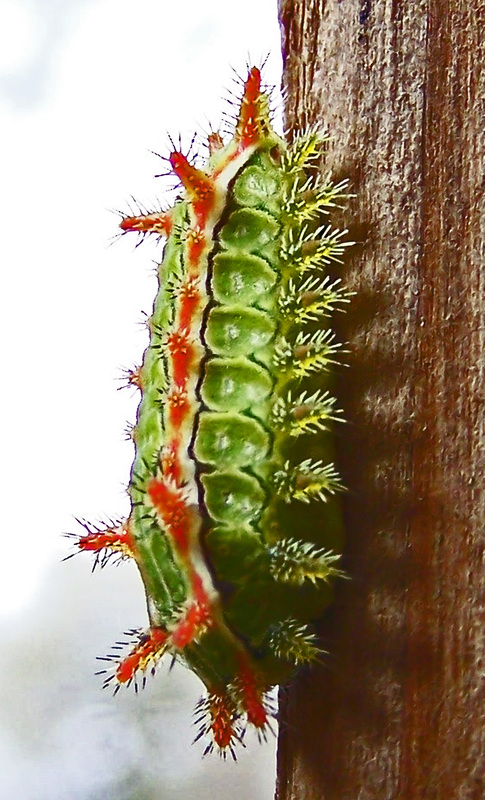 Some of them, for example the puss caterpillar (Megalopyge opercularis), while quite fetching in appearance, are armed with spines that are capable of inflicting excruciating stings. 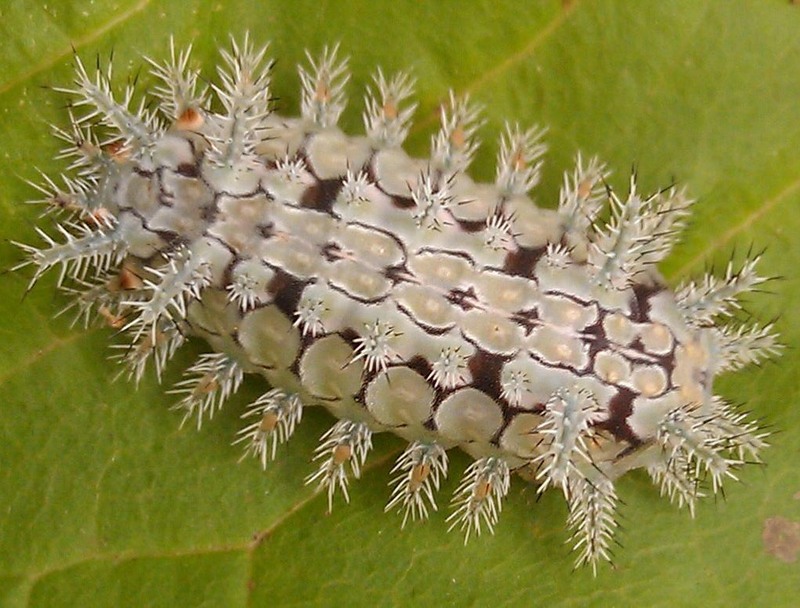 Others, like the spiny oak slug pictured here, are both beautiful and in possession of spines similar to those of the puss caterpillar, but are considerably less virulent with regard to the effects their stings produce when humans come into contact with them. This caterpillar can be found throughout the tropical and subtropical world, including much of the lower 48 United States, Mexico, and south into Central and South America. In the U.S., from Missouri southward two or more broods can be expected annually. In cooler parts of the U.S. only one brood will be produced each year. The flattened, ovoid larva is armed with spiny tubercules along the back and sides. The spines are somewhat fragile, hollow, vesicles that are filled with a mild toxin. When another organism contacts these spines, their sharp points easily penetrate the skin, breaking off and fracturing, releasing their load of toxin. The sides have dimples that are ringed with black or, as with Turvey’s specimen, white hairs. In the final instar these caterpillars usually have from two to four sets of black hairs at thir posterior ends. These, which are known as ‘caltrop’ spines for their supposed similarity to the Roman caltrop, a tetrahedron of spikes that, when tossed onto a roadway, a pit, or at an adversary, always has a spike pointed up when at rest on a planar surface. The Limacodidae family of moths (alternately known as Euclidae) is in the superfamily Zygaenoidea (or Cossoidea, depending on the taxonomist). These are called slug moths, as their caterpillars superficially resemble slugs. The family includes about 400 genera and some 1,000 species of small, hairy moths characterized by mouth-parts that are either reduced or lacking, and fringed wings. At rest, the moths typically perch with their abdomens projecting out at right angles from the thorax and wings. Those found in North America are clothed in brown, and are sometimes marked with white or green. An exception to this is the hag moth, which is brightly colored in yellow and black. The final larval instar constructs a silk cocoon. This is then fortified with malpighian tubule secretions comprised mostly of calcium oxalate. The hardened cocoons are fitted with a circular escape hatch. This hatch is actually a thinning in the silk matrix that enables the pupa to produce an egress port in the cocoon’s shell when it is ready to emerge. If you happen to find one of these in your yard, your first reaction may be to grab the pesticide sprayer. My research suggests that is not a good idea. 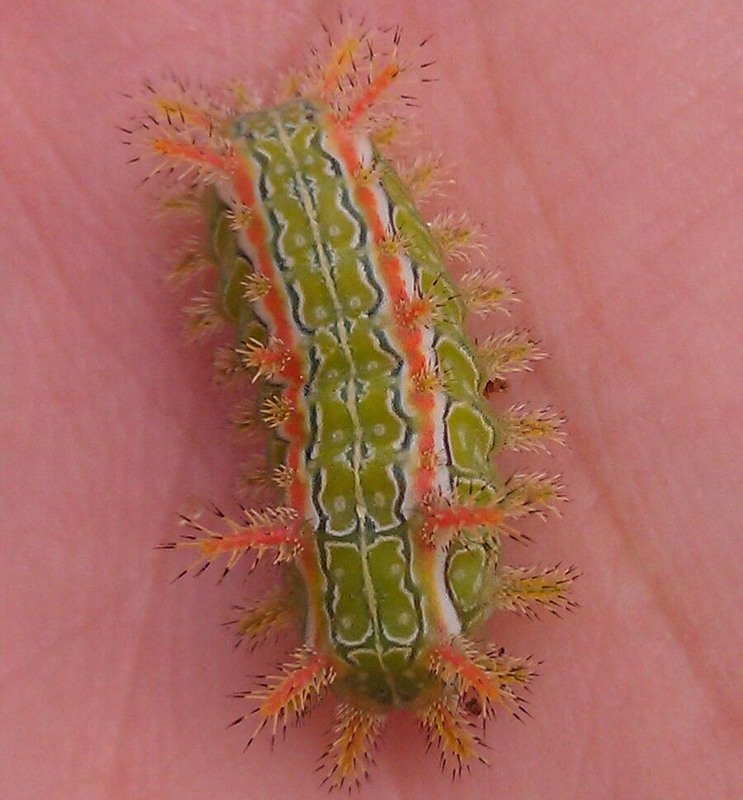 Although the remarks in my posting about puss caterpillar extermination were made specifically for that species, it applies as well for these and all other stinging caterpillars found in the U.S. Pesticides, including natural, biological pesticides such as BTi, kill the natural enemies of these organisms much better than they kill the caterpillars themselves. As a result, when pesticides are used against them, these caterpillars often return to re-infest the same area, while such re-infestations are less likely if pesticides are avoided and the natural predators are given free rein to bring the infestation to a conclusion a la Mother Nature. Genus Euclea (YEW-clee-uh) … The details surrounding the etymology of this name are murky. The prefix is of Greek derivation (ευ-, “good, well, pleasing, well”), while the suffix is in doubt, being, we speculate, either from the Greek suffix -κλης, which is attached to many Greek proper names to indicate honor or fame; or alternately, though such mixing of languages is a questionable — though not unheard of — practice, this may derive from the common Latin suffix, -cle, a suffix that denotes a diminutive character. Species Euclea delphinii (Gray, 1832) (dell-FINN-ee-eye) — The specific epithet, delphinii (from the Greek δελφινιον, delphinium, a reference to the temple of Apollo, in keeping with the habit of the master taxonomist Carl Linnaeus [1707-1778], who applied that epithet to a number of moth species), was first described by the British zoologist George Robert Gray (1808-1872), who first described this species. He did this in 1832, at the age of 24, one year before he, his older brother, and several of their colleagues founded the Royal Entomological Society of London (1833). Gray’s older brother was the British zoologist John Edward Gray (1800-1875), also a British zoologist of some repute, whose work involved all branches of zoology but focused on the molluscs. His involvement in zoological endeavors began at the age of 15, when he volunteered to collect insects for the British Museum. Their father was the noted pharmacologist and botanist Samuel Frederick Gray (1766-1828).